Bremerton gold medalist Nathan Adrian and a large Cal Aquatics contingent that includes gold medalists Natalie Coughlin and Anthony Ervin will head to Europe for the Mare Nostrum Series this week. Cash prizes are awarded, up to $20,000, plus bonuses for breaking series and world records. The first meet will be in Monaco Saturday-Sunday, Canet, France, on June 11-12, and Barcelona, Spain, on June 14-15. The 100 freestyle in Monaco is Saturday and the 50 is Sunday. Adrian is seeded first in the 100 free in 47.84 seconds, and is seeded second in the 50 free behind Ervin. The group includes Cal head coach Dave Durden and Tom Shields, Damir Dugonjic, Josh Prenot, Jacob Pebly and Ryan Murphy. Great story from Associated Press writer Janie McCauley from the San Francisco bureau on California’s Olympic swimmers, namely Nathan Adrian of Bremerton, and Natalie Coughlin. BERKELEY, Calif. — Nathan Adrian razzes a few college swimmers who come a little too close to hitting him while flipping the lane rope out of the pool at the end of practice. Natalie Coughlin reminds the freshmen athletes that the picture-perfect Bay Area weather of recent months is hardly the norm. That’s an awful lot of Olympic medals speaking from experience on the pool deck at the University of California. Add in Anthony Ervin and a handful of other Olympians and former Cal swimmers from outside the U.S. training under Golden Bears coach David Durden, and you might have some 20 Olympic medals in one lane on a given day at Spieker Aquatics Complex. While other universities have their share of Olympians regularly roaming around campus to train, Durden considers his situation unique because the school only trains its own former swimmers. This group has quite the pedigree. Yet Adrian and Coughlin insist they gain as much from swimming alongside the college students, especially when it might be 2012 four-time Olympic gold medalist Missy Franklin in a neighboring lane. Adrian, Coughlin and Ervin soon will be headed to the European Mare Nostrum Series held each June. At this stage, it’s all about keeping things fresh for the Olympic stars. 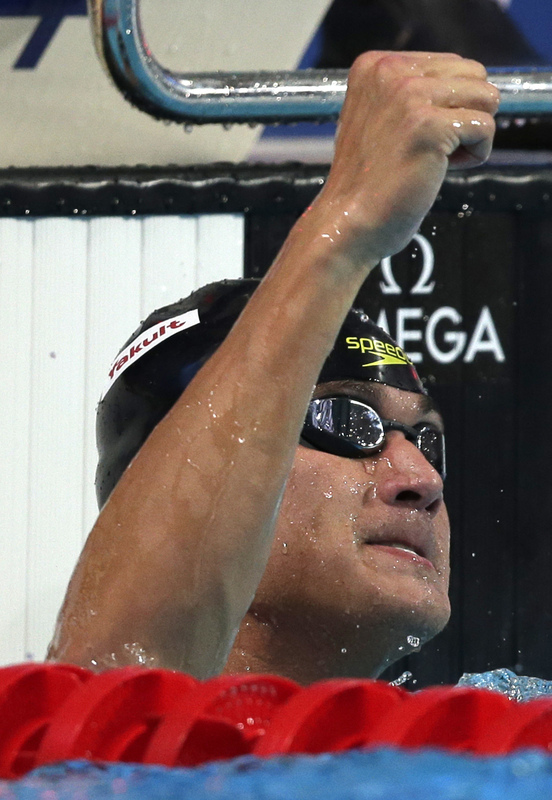 Durden regularly recalls last summer’s world championship trials in Indianapolis when Irvin — the 2000 Sydney Olympics 50-meter freestyle gold medalist — was about to head out for the day to rest up for his later events but instead opted to stay at the meet to watch then-freshman Jacob Pebley swim the 200 backstroke. Other postgraduate swimmers training at Cal include Damir Dugonjic, an Olympian for Slovenia trying to return for the 2016 Rio Games, Estonian two-time Olympian Martin Liivamagi and 2016 American Olympic hopeful Tom Shields, an 11-time NCAA champion at Cal. During a training session this past week, Coughlin shared a lane with junior Fabio Gimondi and sophomores Nick Dillinger and Tyler Messerschmidt. Adrian swam alongside freshmen Jonathan Fiepke and Dillon Williams. Typically, during the college season, the pros would work in their own lane because they’re on a different training track. Nort Thornton, the 81-year-old head coach emeritus who coached the Bears for 33 years and guided three-time Olympian and former world-record holder Matt Biondi, believes Cal swimmers thrive with the support from one another in dealing with the demands of balancing school and athletics. Coughlin plans to support Franklin in any way needed, even if they aren’t training together.